Chicken wings are one of my favorite happy hour appetizers. Once I turned 21, I frequented one of the favorite sports bars in Cedar Falls that had cheap beer and cheap wings during happy hour.Â Beer and wings would be my meal. I love the combination of the hot wing sauce, the cool bleu cheese (PLEASE NO RANCH! ), and crisp celery; it is finger-lickin’ good. When I was pregnant with Sasha I constantly craved anything labeled “buffalo chicken”, I would still indulge myself knowing that later I would have massive heartburn. Chicken wings are good but a lot of work and gnawing around bones isn’t ideal for small children; hence the boneless version seen here. I used boneless skinless chicken breasts, which I sliced into about 1 inch strips and cut the strips into about 1 inch chucks. Heat oil in a dutch oven to 375 degrees F.
Mix in a shallow dish egg white, Tabasco and milk. Put flour into a zip top plastic storage bag. Coat chicken in egg mixture, then toss in the bag with flour. Shake until chicken is thoroughly coated. Fry in small batches until chicken is golden brown, a couple minutes on each side. 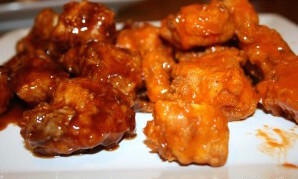 Toss half of chicken in wing sauce and the other half with the honey and BBQ sauce. Serve with a good bleu cheese dip. ENJOY! Pingback: Jamie’s Recipes | Happy New Year! Summer, swimming, and snacking go hand-in-hand. Fresh Watermelon Salsa tastes like summer on a chip. It is both sweet and spicy, cool and refreshing, and great with lemonade or a margarita. Everyone wins!